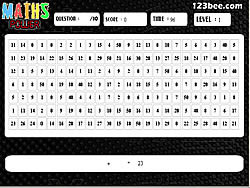 This is a game that has 10 stages,wherein you have to choose the numbers to get the required end result. The game starts off simply with additions and subtractions, but remains fairly easy to complete. when you reach the 10th stage, there are more calculations to do, and it becomes that much more difficult, as the game has to be completed within the stipulated time.